brooks91 had the most liked content! Need to start a, “Graham Harrell Rumor Mega Thread” to keep the mega threads organized. The staff cannot make adjustments in the second half. In our 3 losses, we’ve scored 6, 0, and now 3 points. Other teams have scored 3, 19, and 24. No ones going anywhere if they keep blowing games like this. Bringing a Baby to the Game?? She doesn’t have any family in the area and all of mine work weekends. Baby’s only 5 mos so besides daycare, we’ve never left her with anyone. Really, we haven’t done anything without the baby. Going to the store, restaurants, or around town, she comes with us. We’ve already been on 3 flights with her so nothings really changed. Hasn’t crossed my mind for anything that we need to leave her at home yet. I did see the diaper bag policy but wasn’t sure about the stroller. Thanks! Noise doesn’t really bother her but I’m worried about the cannon. I bought her some sound mufflers so I’m gonna have her wear and get used to them during the week. Anyone who’s done it before have any advice? Havent been able to convince my wife to go with the baby yet but I went ahead and bought La Tech tickets when they were on sale. I have a week to build my case. NY6 bowls give a bid to one g5 team, it wouldn’t be two. Last year was UCF, year before was WMU, then Houston, and then Boise State. Is the game on anywhere in Denton area? I use the shuttle regularly. It goes by the DCTA station, Eastside and on Fry. It makes for a fun day to pre-game at Eastside (or another bar) and watch some football there, and then hop on the bus. The shuttle takes you back to fry or the square after the game and you can stay again. I live on the square so it’s even more convenient because I don’t have to worry about driving for the whole day. Got another shout out on their morning show. 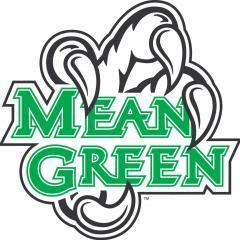 I’m paraphrasing but it was mentioned that, “UNT kicked the snot out of SMU”, that “they look like a championship team,” and that, “the Mean Green are the real deal.” Some more good pub! They’re an FCS team in the Southland conference.